These are just a few of the questions that get asked when you announce your intention to “sail off into the sunset”. Never mind that we’re planning to sail south and the sun sets in the west. 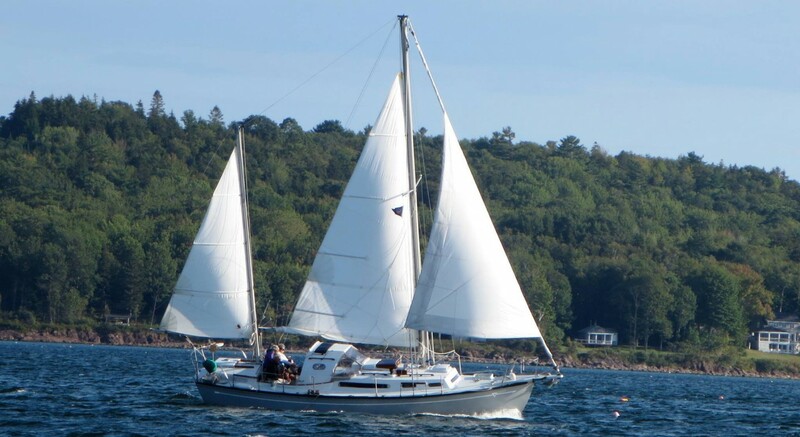 For most people, the idea of actually living full-time on a 32′ sailboat is totally foreign. Like, crazy-foreign. Add in taking that boat from Maine to Florida while living on it, and “crazy-foreign” tends toward just plain “Crazy”. Who would want to do such a thing? What about all your stuff? What about your favorite TV shows? What about pirates and crime and exploding boats and running aground…? I recently started following another couple’s blog entitled The Cynical Sailor. It’s a great read, well written, and follows one couple’s journey along this same path – but they’re a couple years ahead of us in the process. A post that caught my eye was called “10 Steps To Becoming A Full-Time Cruiser”, and I was struck with how much is similar even when the names and locations are different. One of my first posts mentioned that we’d sold real estate, bought an RV etc., but I thought a more complete description of the process of becoming truly portable might be interesting, and even useful. The house Nicki & I currently live in is a rental in midcoast Maine. Up until about a year ago Nicki also owned a house farther inland which was a leftover from her prior marriage. We’d never lived there together, and had no interest in it, as it was way too far from the ocean for us. The path to selling it – with a recalcitrant ex-spouse tying things in knots whenever possible – was long and rocky, but it did finally pass from our stewardship early last year. Whew! So glad to be shut of that. Now let me just say that I’ve never thought of myself as “RV People”. But the older I’ve gotten, the less interest I have in maintaining excess living space just for the sake of having it. The RV is, actually, huge. Almost three times the living area of “Sionna“, but as a land base for our summers back in Maine (while the boat waits for us in Florida) it suddenly made a lot of sense to me. Actually I’m pretty excited about moving in! So that answers the house question. No, we don’t own a vehicle to pull it, but since we have no intention of moving it from its current location in an RV park, that’s not an issue. When we’re done with it, we can sell it, and moving it will be their problem. In any case, we think we can reduce the “keep” pile to something we can fit in a 5’x10′ storage unit, and my tools and spare boat parts should all fit in the 8 foot utility trailer I use for a catch-all. Our most excellent friends (and former-cruisers) Patti & Ray have agreed to let us park that little trailer at their house for a couple years, so that and a big yard sale should take care of “stuff”. And the business? Well, our little handyman business, which we’ve run for almost two years, has just reached the point where we were starting to be known a bit, so that was a bit of a wrench, but we made the decision to “live first, work second”. Or perhaps it was “Work to Live, don’t Live to Work”. In any event, December 31st we officially closed our business, referred our clients to other people, and took the phone off the hook. Compared to many, our expenses are and will be relatively modest. We started from the beginning subscribing to the advice of the Guru’s of modern cruising – Lin & Larry Pardey (landlPardey) whose mantra “Go Small, Go Simple, Go Now” has informed our every decision. A small boat (at 32′ Sionna is quite small by modern standards, though she feels quite ample to us! ), with simple systems and minimal electronic and mechanical jiggery-pokery was at the top of the list to keep expenses down. A simpler lifestyle is next, and we’re doing pretty well there. As for income, we’re fortunate, though I don’t recommend being disabled out of your first career as a way to fund a cruising dream! Still, I’ve got a bit of a disability insurance thing that brings in a few dollars, and both Nicki & I are able to work productively, in spite of that prior issue, so with my stipend and working in Maine during the summer to collect “Freedom (cruising) Chips”, we’re pretty sure we can bankroll this thing if we’re really, really frugal and careful. Living on the boat SHOULD be slightly cheaper than living ashore. We much prefer to anchor, rather than paying for a marina slip or mooring, and I’ve enough skills to handle almost all the boat and RV maintenance that’s required of the lifestyle. It won’t be high-off-the-hog living, but we’ll do ok. So that’s how we’ve handled those nagging questions. Others have come up with different answers, of course, and I’m always curious to hear from other cruisers about their choices along those lines. Oh, and the TV shows we’ll miss? Haven’t owned a TV in 10 years – and haven’t missed it a bit. Waste of a finite life, in my opinion. Categories: budget minded, Cruising, Frugality, Living aboard | Tags: Frugal, Lin & Larry Pardey, RV, Sionna | Permalink.